The Employees Provident Fund (EPF), a cash-rich retirement savings fund, plans to invest almost half a billion ringgit in a commercial project in Petaling Jaya, a deal that sees it tying up with WCT Bhd, a construction and property group. The EPF is also a substantial shareholder in WCT, holding 17.22 per cent. The tie-up also comes as the cost of borrowing money in the capital markets has risen. A weak stock market makes it difficult for companies to raise funds. "(The deal) provides an opportunity for WCT to raise funds for the general working capital requirements of the WCT group and to finance viable property development projects that may arise in the future," WCT said. Under the deal, WCT will sell 30 per cent of Jelas Puri Sdn Bhd (JPSB), the company that will develop the RM1.06 billion project, to the EPF for RM87.36 million cash. This is due to be completed in 2011. JPSB will also issue five-year redeemable secured loan stocks worth some RM390 million to the EPF. The loan stocks carry interest of six per cent a year. The bulk of the loan stocks, or RM320 million, will be issued in the first quarter of 2011, and the rest in the fourth quarter of the same year. 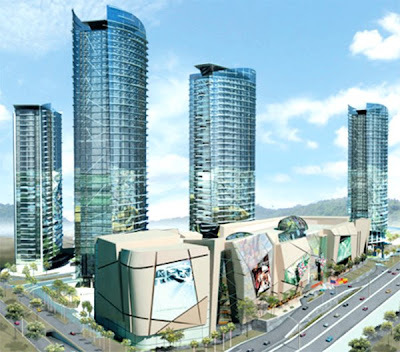 JPSB is developing "The Paradigm", WCT's first high-rise commercial project in Petaling Jaya. Last year, the local authorities approved the revised plan for the project. It will feature four blocks of 25- to 33-storey office buildings, one block of 15-storey office suites, one block of 20-storey office suites and a six-storey shopping complex. However, JPSB is preparing a new application to revise plans for the shopping centre and the four blocks of 27- to 33-storey office buildings, WCT said. The project has a gross development cost of RM1.06 billion, and JPSB has spent some RM107 million to date. Shares of WCT on Bursa Malaysia closed unchanged at RM2.53 yesterday. TALKING SHAPE: Work in progress at the 279ha Puteri Harbour at Nusajaya. UEM Land Bhd is talking to investors in South Korea and South Africa to develop some components of its multi-billion ringgit integrated waterfront and marina development in Nusajaya, south of Johor. Dubbed Puteri Harbour, the 279ha development features high and low-rise residences, bungalows, corporate towers, retail shops, and five-star resorts, among others. 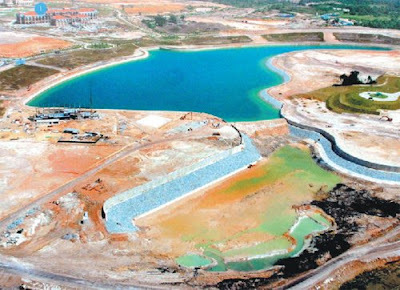 "Developments at Puteri Harbour are shaping fast. We are talking to a few foreign investors and local listed developers to make investments here. They have expressed interest and there will be some announcements this year," UEM Land Sdn Bhd deputy senior manager, commercial development, Tan Li-Ann said. Tan declined to name these parties. She spoke to Business Times during a site visit to Puteri Harbour yesterday. UEM has so far signed two joint venture agreements with companies from the United Arab Emirates to make investments in Puteri Harbour. The first is with Limitless LCC to develop a RM1.6 billion project comprising of canal homes (bungalows, townhouses and high-end serviced apartments) on 44.4ha and the second with Damac Properties LLC to develop a RM3.8 billion project comprising offices and luxury condominiums on 17.2ha. PROPERTY developer Golden Plus Holdings Bhd (GPlus), which derives most of its business from Shanghai, China, aims to venture into Vietnam and India next year. It has hired consultants to do feasibility studies on both property markets, to gauge the potential demand for high-end property developments. "The Malaysian market is a bit saturated. Because of the kind of population you have in India and Vietnam, we think the uptake for this kind of project on the development pitch that we have will be accepted quite favourably," said director Jeyaraj Ratnaswamy. The company may partner local parties. However, talks have not started yet. Jeyaraj said the expansion plan can only proceed when issues with creditors are resolved. "We are expecting them to be resolved by end of November," he said after its annual general meeting in Kuala Lumpur yesterday. GPlus launched 10 blocks of luxury condominiums in Shanghai recently, of which, six blocks are open for sale. So far, half of that have been sold. Executive director Low Thiam Hoe expects demand for high-end residential property in China to slow down, due to slower global economic growth and new government rules. It plans to launch its mixed-development project next year, which will be ready by 2015, comprising a 500-room hotel, a shopping mall, and an office block among others. Also, the company which had issues with shareholder Indian Corridor Sdn Bhd is compiling evidence to take legal action against Bursa Malaysia for violation of corporate governance. "We are about 70 per cent done with compiling evidence," said GPlus counsel Datuk Krishnan Kumar. Bursa Malaysia wants a special audit to be done on GPlus, to see if the company's financial and business affairs comply with listing rules. Krishnan claimed the recent action by Bursa Malaysia triggered a conflict of interest as the lawyers for Bursa Malaysia are the same lawyers who had advised Indian Corridor. However, Bursa Malaysia has denied this. "Bursa Malaysia has been advised by Skrine that there is no conflict of interest involved in Skrine acting for Bursa Malaysia in this matter," it said in a statement. GPlus' tussle with Indian Corridor and Pembangunan Qualicare Sdn Bhd, which own 19.75 per cent of GPlus, began last year. The shareholders were unhappy with a management agreement signed between Yanfull Investment Ltd, GPlus' unit, and a Chinese company. At one point, Indian Corridor requested an investigative audit to be done on GPlus. The company said it has no issues with the special audit. "We have nothing to hide, but who is going to bear the cost?" Jeyaraj said. So far, four audits have been conducted on the company, which costs more than RM500,000 in total. The special audit, which is also its fifth audit, could cost some RM500,000 alone, based on the job scope. PARAMOUNT Corp Bhd will undertake new property launches but on a smaller scale in an effort to mitigate the risk of a slowing down in the market. "We are not in a hurry to push the top line. What we can do is to keep the property market interested by doing new but smaller launches,” said group managing director and chief executive officer Datuk Teo Chiang Quan. Speaking to reporters after the company’s extraordinary general meeting (EGM), he said the company had just two new launches this year in Kemuning Utama, Selangor and in Sungai Petani, Kedah. According to Teo, the company has a combined 700-acre landbank in the Klang Valley and Sungai Petani, to be developed as major gross development value (GDV) projects. The property segment contributed some 60 per cent to the company’s revenue while the remaining came from the education business through the KDU Group. “We are looking for more landbank in the Klang Valley as it has a lot of potential,” he said, without indicating any size. At the EGM, Paramount got its shareholders' nod to acquire the remaining 15 per cent stake in KDU College for RM25 million cash from Rohana Mahmood, a director of the college. Rohana bought the stake in June 1997 at RM1.412 million. “We might divest some of the stake in the future,” Teoh said. He also said that the KDU Group would set up a school with a different concept in the Iskandar Development Region, Johor, as it was reviewing the original plan of establishing a Smart School there. “We need to respond to the market place,” he said, adding that the new concept would change the original investment figure of about RM53 million.